Yamaha p45 Vs p71 – Which is best? The Yamaha p71 and the Yamaha p45 are two excellent keyboards. And this is where it gets funny, because which of them is best? This is a logical question, and naturally, everyone wants to know it but these two pianos the exact same digital pianos. There are no functional differents. They may be some minor changes in the design but nothing more. But why do they have different names? The question about “Yamaha p45 vs p71” came up because the P71 got featured as an Amazon Exclusive and it is, but that’s possibly also the reason why it’s more expensive than the Yamaha P45 (Around 80 Dollar cheaper). Both digital pianos feature a Graded hammer standard keyboard with DUO and DUAl mode. Both have ten voices and the possibility for USB to Host to get more sounds. I hope that I don’t need to say more to make this clear. The Yamaha P45 (On Amazon) offers a similar bundle with a stand, a chair and some extra headphones… Sweet! There are different versions of these bundles with maybe a particular sustain pedal, or a note holder. It could be that Amazon adds some cosmetic features but for the time being there is no difference. 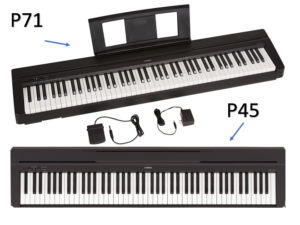 The whole use of this “Yamaha p45 vs p71” article was it to inform you that these are identical keyboards and that the only difference is the price and the opportunity to get a sweet bundle. You should buy whichever model is cheaper. At Marts 2018 – Amazon UK gives the Yamaha P45 away for 80 Bucks less than the P71. I still think that they will make the Yamaha p71 cheaper so they can sell their “exclusive” product rather than their competitor ones. If you want to learn more about the Yamaha P45 I have an article about it on my side: Just click here. It’s a beautiful piano, and I would recommend it because of the excellent compromise between price and performance. The only thing you need to know; don’t use the organ sound, it’s not good, but everything else is just as you expected from Yamaha: Good build quality and in general as good as it could be for this price. You will be satisfied with the piano whether it’s the P45 or P71. Hello! I'm the creator and admin of PianoPanel.com. I want to create a nice place which has some valuable information about interesting Piano Styles, Song, Theories and more! I hope you like it! If you have any questions, don't hesitate and write an email! It is interesting in reading the reviews from customers on Amazon they seem to rate the P45 as not as good in comparison to the P71. Do you think this is just Amazon promoting their own version? I’m super confused as to which to buy. I’ve read several articles about the fact they are pretty much the same instrument. I did hear that there is more connectivity with the P45 to different devices. I can understand the confusion… trust me. They are nearly the same piano, the p45 is ever so slightly more lightweight, but that doesn’t change anything. Personally, I prefer the P71 because you will get an excellent service and guarantee from Amazon. The P71 was also released a bit later, which could mean they changed some small things inside the piano. To give you my point of view: Both are good and functional pianos, it won’t make a huge difference whether you buy the P71 or P45. I hope I could help.